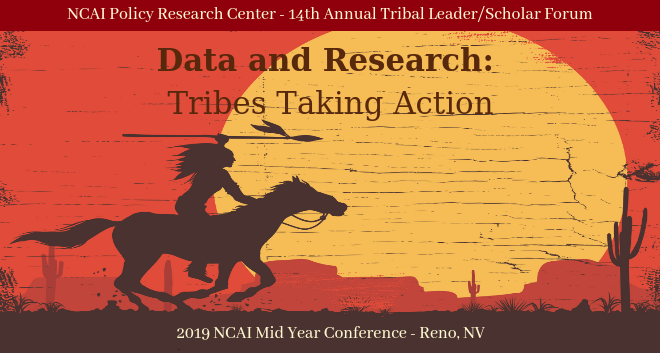 The NCAI Policy Research Center’s Tribal Leader/Scholar Forum provides an opportunity for researchers, practitioners, community members, and others to present their findings to tribal leaders, policymakers, and tribal members during NCAI's Mid Year Conference. The 14th Annual Tribal Leader/Scholar Forum will be held on Wednesday, June 26, 2019 during the NCAI Mid Year Conference and Marketplace in Reno NV scheduled for June 24-27, 2019. The agenda is now available! To register, visit the NCAI Mid Year Conference webpage. The Forum includes a plenary session, breakout sessions, and poster sessions. A Post-Conference Data Institute will also be held on June 27, 2019 featuring a training on strengthening tribal-academic research partnerships. The NCAI Mid Year Conference also features NIH tribal consultation sessions on intellectual property rights in research and the All of Us Research Program. Watch here for more information. The Call for Presentation Proposals is now closed. Questions? Email us at research@ncai.org. Our theme for the 2018 Tribal Leader/Scholar Forum was Lighting the Way: New Paths from Research to Policy. This theme reflects the desire to shed light on future directions for policy in a way that is deeply informed by research and data in the context of tribal cultures and values. The Forum took place on June 5, 2018 in Kansas City, MO. How Data can make the Native Vote a "Swing Vote"
The 2018 Call for Proposals is now CLOSED; Presenter notifications completed. Click on the session titles below to download agendas and PDFs of the presentations! For more information about the Tribal Leader/Scholar Forum and how to engage in future gatherings, please contact the Policy Research Center team at research@ncai.org. Conference proceedings from prior years are archived below.